GTA V and a few other titles wouldn't run above 40 FPS, yeah!!! 40.... on ULTRA at the above mentioned resolution. I've had the exact same problems with my games since windows 10 FCU. Also turn on pstate leds and make sure it uses the max pstate. On the reference vegas, you can turn on 8 leds so you can see what core pstate the gpu is using. When all the 8 leds are on you are using the max power of the gpu. Unfortunately as you can see here I am the first that probably has your problem and the pstate can't go over p3 (4 leds on) thus resulting in embarassing performance. I can't open the link that you've provided. It says, "Unauthorized". It must be authorized, they should do it soon. Anyway turn on the gpu pstate leds with the switch on the right side (there is a switch for its color, red and blue near to it, and on the other side a bios switch, don't touch it). Then watch if all the leds are on. First, do a clean install of the chipset drivers and the Radeon drivers if you haven't done that already. Make sure the AMD frame rate limiter, radeon chill, and virtual super resolution are all disabled. The pstate LEDs are on..
as far as the "CLEAN" install goes, I already mentioned brother that I just re-installed Windows 10 with all the latest updates and for the drivers part, I just installed latest CHipset and Radeon from AMD Support website. Beyond the settings I already mentioned, it would also be worth while to remove your CPU and DRAM overclocks, check your frame rate, and then reapply them one at a time. Check you Radeon Settings and slide the power allowance up a bit, to about 20% and then recheck performance. Also, make sure you are using two separate runs of power to the card and do not daisy-chain them. I'm running a similar setup with a higher resolution screen and my fps are totally fine. Since he is using a reference air cooled Vega, sliding the power allowance up probably won't do much. The air cooled cards tend to temperature throttle at 220W already. That's not true, giving a 50% power limiter normally boosts up the performance. Only if used in concert with undervolting. Vega 64 air cannot maintain it's boost clock at 220w due reaching the 85C temperature restriction and so it throttles. Upping the power limit makes that happen faster. If you remove the temp throttling with a better cooling solution or by undervolting you can see decent gains by upping the power limit. That refers to the power cables. For Vega, it is a good idea to make sure that it is two separate cables connected to the GPU that are individually connected to the PSU, as opposed to a two headed cable. I actually had to replace a power supply because I unknowingly only used one cable from the PSU to the card. The unit was single rail so it worked for some time but after awhile it actually damaged the connector at the supply end from such heavy power draw; I have pictures. The card did work for some time but would black screen on me once it tried pulling heavier current from the PSU. Depending on the power supply design, a single cable might not be delivering enough power for the card to run at full tilt. Vega likes a lot of power, so it's best to feed it with two separate cables. I got lucky and thankfully only had to replace the PSU. You should use two separate cables regardless, but yes that unit has four individual +12v rails which distribute power differently than say a unit with a powerful single rail. The power supply that I had fail on me was a powerful single rail 850w which powered the card through one cable but it eventually fried the end that connected to the ports on the PSU. I actually couldn't even pull it out because it had fused inside the socket, not good. Do you use discord or something? So, I can hook up with you a bit faster... I mean, I wanted it fixed bro.. 3 months, and damn, I daily think about selling this thing off... coz it's not doing me any good at all... Could you please? I don't use discord but I'm typically on Steam after work hours around 8pm or so EST. I'd gladly try and help you out then but I wouldn't ditch the card just yet. I was ready to turn mine in at one point but I confirmed that it worked perfectly on another system; the heavy power draw is what lead me to inspect my power supply further. I think you may be onto the main problem for the low fps. The OPs PSU can, do 1000W of work total, but that work is split between the available rails by splitting the amperage. So each rail is only capable of doing 250w of work. For Vega then, it would be imperative that each of the two 8-pin cables be on a separate rail. As for the crashing, I still think that is related to the 1.35v and 3.8 Mhz on a stock cooler on the CPU. Scaling that back should help with the crashing. Looks like others had similar issues with GTA V and that specific resolution. It was resolved by running the game on Ultra with X2 MSAA and all the advanced features disabled. Unfortunately, I do not have GTA V, and can't test this out on my own Vega system. Yeah, I apologize. Unfortunately, I don't really have access to discord/Skype here at work. I can chat over those services in the afternoon/evenings when I'm back at home. Basically I check various boards when I'm waiting for data acquisition here at work. The FPS you are getting now sound more in line with what I would expect from Vega. There does seem to be an issue with GTA V and the ultrawide resolution you are using. The user in the reedit article also saw the same drop even on a GTX 1080 Ti. As for Relive, I cannot help you there, as I haven't used it, or even installed it. The image I have attached is "hopefully" your PSU. 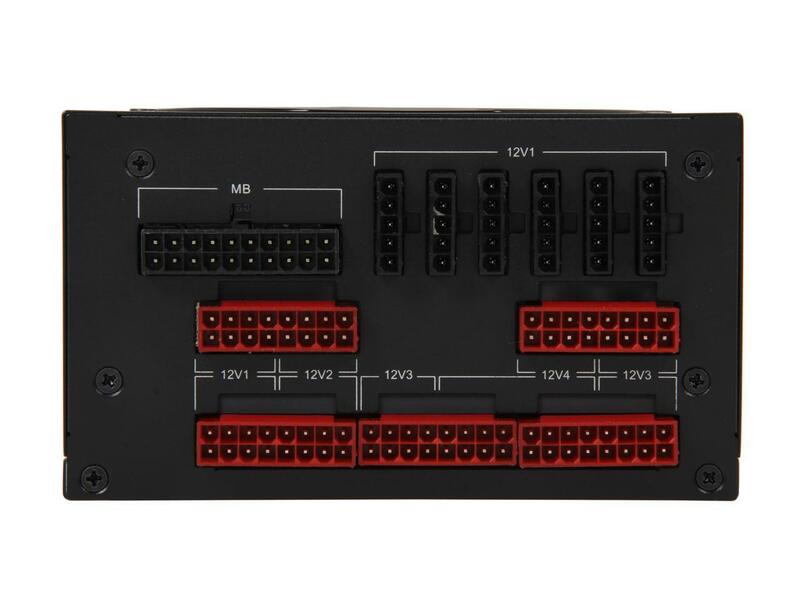 You want to make sure that one of the 8-pin cables connected to your Vega, is installed in the red 12V4 slot on your PSU. The second 8-pin cable should be in the red 12V3 slot on your PSU. No other 12V4 and 12V3 slots should be populated with any cables. 12V1 isn't the greatest to use for your GPU, as all your other PC components (HDDs, etc.) are powered by this rail as seen by the five pin connectors at the top of the image. You want to make sure the two 8-pin Vega cables are going to a different 12V#, and that those rails have nothing else on them. Forgive me, but is the bottom blue circle covering 16 pins? It looks like both 12v3 and 12v4 are filled down there and 12v4 is used again in the upper circle. If I had to guess from this image, it looks like your two Vega cables are both in the bottom blue circle. That cable spans 16pins and seems to be in one sleeve. The upper blue circle appears to be another 8-pin cable, that is also plugged into 12V4, just like half of the 16 pin cable. I would move the upper blue circle cable from 12V4 to 12V2, right in between the green CPU cable, and the 16 pin blue cable. There doesn't appear to be anything on 12V2 right now. ajlueke man plz give me some kind of IM contact so we can communicate faster... this is slow as hell... sorry... anything? Discord, Skype anything? So, it looks like you have a total of 24 pins in the yellow section. Vega uses 16pins, so one of those cables (probably the solo 8-pin) is not running the Vega GPU. Take the solo 8-pin cable (Furthest right, in 12V4), and move it so it is right of the green and left of the larger yellow cable (into 12V2). Any idea where that solo 8-pin cable runs? So now, you should have your motherboard, HDD, and CPU on 12V1, a mystery 8-pin cable on 12V2, and two 8 pin cables sleeved together in 12V3 and 12V4 (for Vega GPU). The reason I ask is, depending on what the extra 8-pin cable powers, it may be better to move your CPU over to 12V2 as well. But either way, you should be good to bring your RAM XMP profile back online and starting with the CPU overclock again. The overclock on the CPU is pretty troubling as well with the stock cooler. Is that a p-state overclock or an "always on" overclock? At 3.8 MHz with the stock cooler, the Ryzen 1700 may be getting pretty hot, and throttling/crashing to protect itself. I would scale that back to default and see if the crashes resolve. You may actually get better performance as well. I'm inclined to agree, especially with that voltage. The stock HSF is good but I don't even like the 1.35v on water but my 1700 needs it to be stable at 3.9 to 4.0 ghz or so. I would also be interested to see what happens if the OC is temporarily abandoned. Clean install Windows 10 with only the latest AMD Ryzen Chipset and Radeon drivers and not any other 3rd party software, whatsoever. I have come to the conclusion that my system gives the optimum performance "intermittently". How? I've tested the following games on a fresh Winsows install, and the performance in the titles as compared with the Vega 64 benchmarks on the internet is unmatchable. I also get frequent FCs of the Radeon Settings (18.4.1 as well as 18.3.4) application. What do you mean by "intermittent" fps? The games randomly run at acceptable frames? I would try turning off the shader cache found in the AMD global settings, reboot and try your tests again. Then, switch it to "on", reboot, and try them again. Do you notice any increase in performance? I'm using the Optimize Performance profile with your mentioned settings. Also, you mentioned you also see the issue with Farcry 5? What frame rate are you getting with your setup in that games internal benchmark? I also have Farcry 5, and I can run through the benchmark and see how our results compare. If you could take a screen shot of the final result that would be great, I'll do the same when I get home this evening. You can do that both before and after resetting your shader cache. Thanks for the data! Just so I am replicating this correctly, you ran both in balance and turbo mode with the shader cache set to "on" correct? Or did you leave it as "AMD Optimized"? Your data doesn't look too bad, an average of 73fps is solid with a monitor that maxes out at 75Hz. And a minimum of 56 fps is good, as I think your monitor's freesync range bottoms out at 48 Hz. Doesn't look like it is hitting 40fps at all. The turbo profile performing identically to the balanced profile is expected with Vega 64 using the stock cooler. The extra +20% power doesn't help the GPU as it thermally throttles before it can use that extra wattage. You could probably get a little bit extra out of it by undervolting though. I'll post my results once I get back home is afternoon. If you'd like to try and squeeze a bit more performance out of your Vega 64, you can undervolt a bit. In your AMD settings as opposed to selecting the balanced or turbo profile you can select custom. You can change the voltage for the State 6 and State 7 power states by setting voltage control to manual under the graph. You will see the power state 6 voltage as 1150 and state 7 as 1200. Try changing these to 1125 and 1175. Make sure to push your power limit slider up to +50% as well. Apply the settings and repeat your benchmark. You can try it again using 1100 and 1150 as well. Going below 1100 on a power state won't accomplish anything without also adjusting the voltage for your memory. Once you have that dialed in, you can play with the fan settings. Raise the target and min to the maximum levels you can tolerate from a noise perspective. Also, make sure to post your gains back here. I'm interested to see how things go! I tried what you suggested... both the 1125, 1175 and 1100, 1150. I also cranked up the Power Limit to +50% and the fan speed to 3500 RPM and guess what, both of your advised tweaks yielded exact same results..... Oh, and dstmnd89x, my HDD is absolutely fine. I checked, it's not an I/O error... Same results on SSD. Did you reapply your CPU and RAM overclocks? If not, I would give that a try. Hmmm, this is really interesting data. First, I do think your GPU is performing well. At least in the Farcry benchmark your not seeing sub 40 fps you mentioned in your original post. What is a little strange however, is that you didn't see any gains at all by undervolting and raising the fan curve. That implies that some other component is bottlenecking the system as opposed to just the GPU. Since you aren't running a pinnacle ridge CPU, there is no reason to update to the latest UEFI, try running the last "Summit Ridge" update for your board. Looks like that is 7A33v36. Here is my run. My minimum and average fps are a bit higher than yours despite the higher resolution, but that is due to the fact that my Vega 64 is under a water block in a custom loop as opposed to air cooled. To me, it looks like your Farcry results at least seem to be in line with what I would expect. There most-likely wont be a magic fix issued by AMD... especially if we are unable to replicate the issues you are having. You keep mentioning that you've reinstalled Windows onto your SSD but what sort of shape is the "game drive" in, the 4TB HDD? The reason I ask is because "intermittent" performance sort of sounds like a disk access or I/O problem and not the graphics card. With GPU's the performance is usually either good or bad, depending on the drivers, and doesn't typically rise and drop in regular intervals. The hits are more likely to occur in certain areas of a game world or when there are a lot of actors or special effects. If you have some extra space on the SSD, try temporarily installing a game on that and see what happens... just curious. That was my thought when I brought up the shader cache. If it isn't working properly somehow, his CPU would need to process the shaders from the game drive (standard HDD) each time they are called, which would could really slow things down.